Montana State Quarters are the 41st variety in a series of fifty design changes over a ten year period from 1999 to 2008. This Quarter was released into circulation on January 29, 2007. 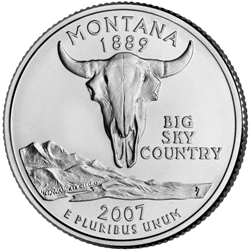 The Montana quarter was the first issue in 2007. It is a very simple design that features a bison skull as its main device. The quarter also shows a mountain range below the skull. The reverse of the coin bears the inscriptions "MONTANA 1889”, "BIG SKY COUNTRY" and "E PLURIBUS UNUM" along with the date of 2007.